• Open fracture – a broken or cracked bone that breaks through the skin. The resulting open wound can greatly increase the risk of infection due to exposure of bacteria in the surrounding environment. II. Cause: Foot and ankle fractures are common among active individuals due to the physical demands placed on their feet and ankles. Stress fractures occur with sudden increases in activity, repetitive stress on a particular area, improper training and stretching techniques, or firm training surfaces. 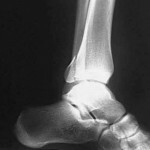 Stable and displaced fractures usually result from trauma, direct impact, or twisting of a bone. • Gradually increase new sports activity, incrementally working your way up to longer runs, or more extreme workouts. Workouts should be spaced out between days of rest. • Maintain a healthy diet with calcium-rich foods. • Use proper athletic equipment. Replace running shoes frequently. Rest is the most important form of treatment once a stress fracture occurs. Allow 6-12 weeks for the stress fracture to heal before resuming activity. Stable and displaced fractures are prevented by avoiding injury or trauma. Using proper athletic equipment, taking safety precautions, exercising regularly to build up muscle strength, and maintaining a healthy diet can decrease the risk of fracturing a bone. • Your foot pain includes swelling and causes a limp for longer than 2-3 weeks. • Your foot or ankle is black and blue after 1-2 days. • You cannot put weight on your foot after 1-2 days. Most fractures can be treated without surgery. If the fracture is in a toe, your orthopaedic specialist may “buddy-tape” the toe to an adjacent toe. If the fracture is in another part of the foot or ankle, a cast or brace worn for 6-8 weeks may be necessary. In extreme cases when the surrounding ligaments are torn or fragments of bone have broken away, surgery may be required. Surgery can involve inserting screws, plates, or bands to hold the bones in place while they heal. Rehabilitation and rest are important to ensure a full, speedy recovery.